Albany, NY is home to nearly 100,000 people. Almost one- third of those people own or have dogs living in their household. There is one particular home that gives sanctuary to a lawyer and his ever present dog, Timmy. Timmy and his human companion travel almost everywhere together. They walk to work, take the bus and go to the doctors together. When the alarm rings at 7am, both Timmy and his companion wake to greet the day. They communicate with each other mostly through voice and touch. They seem to be one fluid energy – moving together, listening to the same sounds, maybe even breathing in sync. Perhaps they are as close as a dog and man could be. This developed through years of working together, a marriage of lives in becoming companions. But at first they were just dog and dog handler. 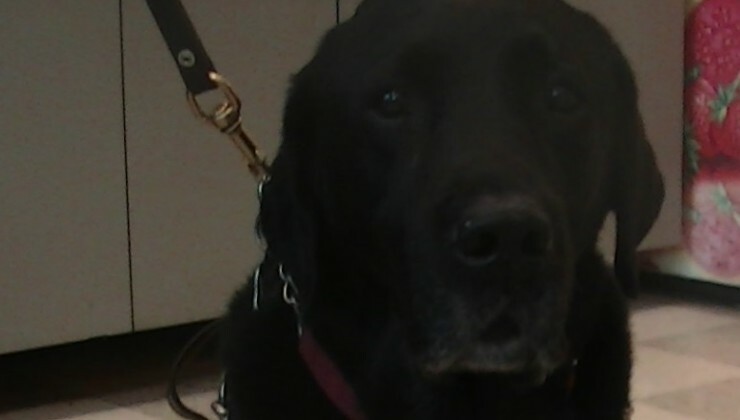 Timmy is a guide dog (formerly referred to as a Seeing Eye dog) for his owner / companion. He is a 9 year old black Labrador retriever, in his 7th year of work and by all accounts – loving it! Timmy grew up in a family environment, as is usual for many service animals. He then entered his professional training at Guiding Eyes for the Blind, which dogs usually attend for 6 months to a year. At Guiding Eyes, there are 4 phases of training that happen before a dog is placed into service. Phase one is learning basic training like forward, halt and navigating obstacles and directions. In phase two, trainers reinforce basic training in real life situations. Phase three involves the dogs preforming their learned training on their own initiative and phase four involves using those skills in large cities and distracting environments. For those who are seeking a guide dog but who have not owned a guide dog, available is an on campus 26 day training seminar. For those who have had a guide dog in the past, there is a home training program. This was exactly how Timmy and his human companion came to know each other. Timmy stayed with his companion full time and together they would meet with their instructor. For two weeks Timmy’s owner worked with him before work, during lunch and after work and focused on situations they may encounter and how to deal with them. And after 7 years of blending their lives together, it’s a sweet mix of work and play. By right of a guide dog, Timmy naturally has to be dependable, obedient, unquestionably well- behaved, intelligent and healthy. He has to navigate strange cities, unknown smells, crowds of people, off leash dogs, ice and snow, traffic and even seating inside a bus. He has to know when to be intelligently disobedient – or know when to disobey a direct command that puts his owner in danger. He has to know without hesitation several commands like forward, right, left, to the door, wait and steady. He has to understand tone of voice for suggestive commands like looking for the correct door to enter from a sidewalk. Somehow, Timmy has even figured out the correct bus to board at the bus station and which floor to exit the elevator on. But for all these superior dog powers Timmy possesses, he also has a great sense of humor. He loves his dog toys, and will tease and play chase with them. Timmy even has his own “suggestive commands” for his companion. He will “suggest” when a walk to the park or a swim is on the agenda, rather than the straight walk home. And Timmy’s companion understands that even dogs with super powers need time off for a little R&R. When Timmy’s harness comes off, he is a dog who plays fetch, chews his stuffed animals and likes to take naps on people’s feet. He is a good dog, more than a pet, more than a companion. Timmy’s days are filled with activities. He is a true working dog. He guides, he naps, he eats, he succeeds and sometimes he even struggles. But each day he gives his unquestionable faith, his strong spirit to those around him. I stood next to Timmy for a few minutes and felt the true stoic and endearing presence he encompasses. A favorite part of Timmy’s day? Maybe it’s going home together at night. Maybe Timmy listens for his owner to say, “Guide us home, my faithful companion.” And together, homeward they travel – dog and man.